Successfully Added Xiaomi Mi Piston Air Earphones - On Cable Control, 2 Channel Stereo Sound, Silicon Ear Tips, 1.2 Meter Cable, Mic, 3.5mm Jack to your Shopping Cart. Soft silicone ear buds ensure a snug comfortable fit. The Xiaomi Mi Piston Air Earphones feature a truly remarkable design, giving them a futuristic look fit for any high-grade audio device out there. Not only do these noise canceling earphones look absolutely stunning, they also provide mesmerizing sound quality that is fit for any audiophile out there. Listen to your favorite tracks or make hands-free phone calls – with these modern headphones at hand, you can be guaranteed to attract the attention of people passing by. 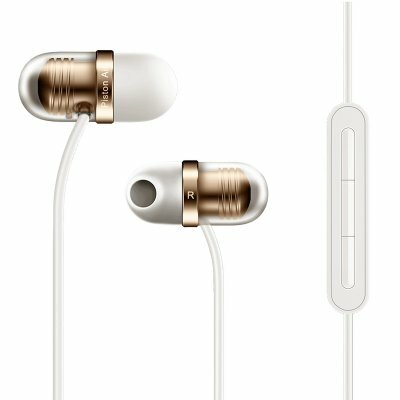 With their specialized design the Xiaomi Mi Piston Air Earphones feature two soft silicone ear buds that enter deep into your ear. By doing so outside sound gets isolated ensuring that you can fully enjoy your favorite tracks to their absolute most. Creating a comfortable and stable fit, these headphones are sure to fit any size and shape of ear out there. Next time you head out for your evening run, grab along these magnificent in-ear headphones to enjoy your music in stunning quality while getting through your exercise. Featuring a built-in microphone this Xiaomi headset additionally allows you to efficiently make hands-free phone calls. Its on cord control lets you simply answer or reject calls without the need of you physically having to touch your smartphone. No longer will there be the need to dig through your bag and search for your phone when receiving a call as with these headphones you’ll be able to answer or reject any incoming call with the touch of a button. Not only does the on cord control allow you to answer or reject phone calls, it also lets you browse through your music library, select a song, and adjust the volume without you needing to touch your smartphone or music player. These multifunctional earphones truly provide you with audiophile grade sound quality – allowing you to enjoy your favorite tracks at any time of the day to their absolute most. Xiaomi Mi Piston Air Earphones comes with a 12 months warranty, brought to you by the leader in electronic devices as well as wholesale electronic gadgets..